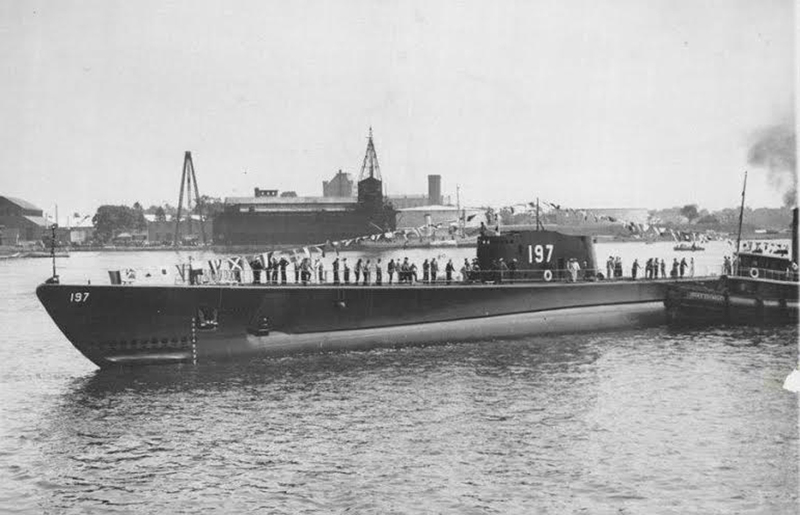 Sargo Class Submarine: Laid down, 27 September 1938, at Portsmouth Naval Shipyard, Portsmouth, N.H.; Launched, 15 August 1939; Commissioned, USS Seawolf (SS-197), 1 December 1939; Final Disposition, while on 15th patrol, accidentally sunk by depth charge attack from Richard M. Rowell (DE-403), 3 October 1944, off Morotai, with loss of 100 lives; Struck from the Naval Register, 20 January 1945. 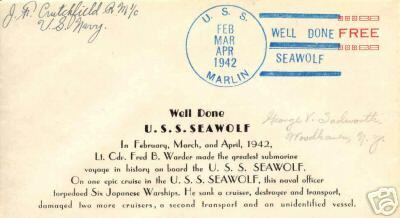 Seawolf received 13 battle stars for World War II service. Specifications: Displacement, Surfaced: 1,400 t., Submerged: 2,350 t.; Length 310' 6" ; Beam 27' 1"; Draft 13' 8"; Speed, Surfaced 20 kts, Submerged 7.75 kts; Complement 5 Officers, 50 Enlisted; Maximum Depth Limit, 250'; Armament, eight 21" torpedo tubes, 24 torpedoes, one 3"/50 deck gun, two .50 cal machine guns, two .30 cal machine guns; Propulsion, diesel-electric engines, GE diesel engines, HP 5500, Fuel Capacity, 190,000 gals., GE motors, HP 2740, 252 battery cells. twin propellers. 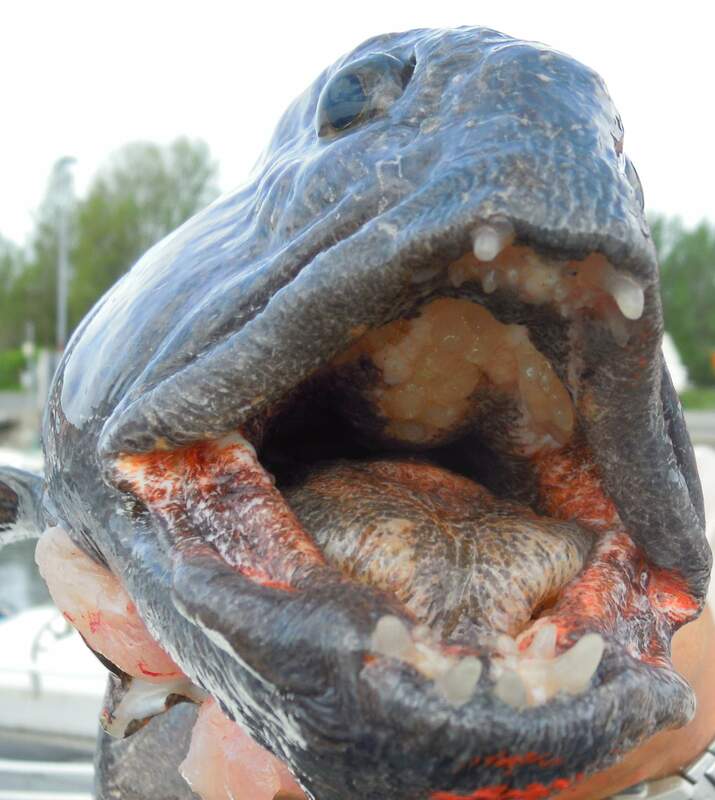 1.36k Atlantic wolffish (Anarhichas lupus) Photo & text courtesy of wikipedia.com. 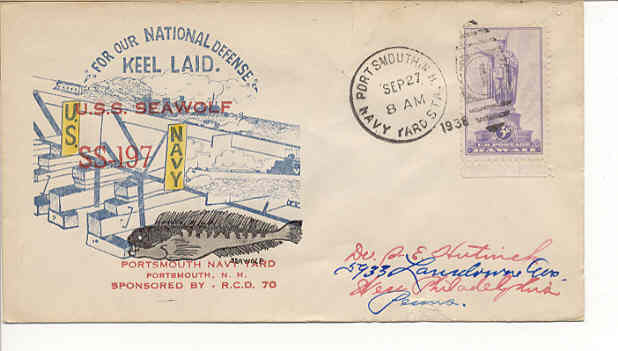 24k Commemorative post mark on the occasion of the keel laying of the Seawolf (SS-197), 27 September 1938, at Portsmouth Naval Shipyard, Portsmouth, N.H. Courtesy of Jack Treutle (of blessed memory). 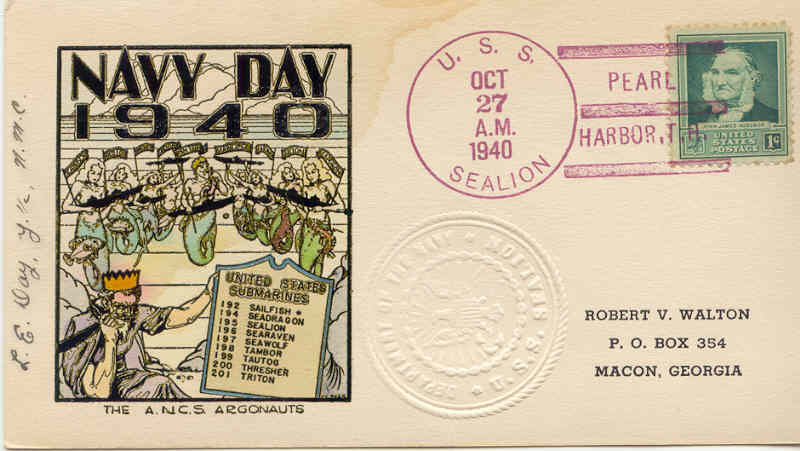 56k Commemorative post mark on the occasion of the keel laying ceremonies of the Seawolf (SS-197), 27 October 1938, at Portsmouth Naval Shipyard, Portsmouth, N.H. Courtesy of Jack Treutle (of blessed memory). 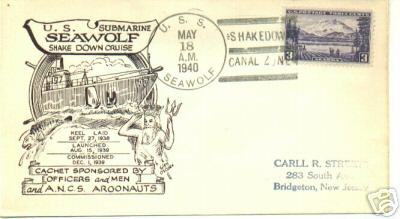 130k Seawolf (SS-197) was sponsored by Mrs. Edward C. Kalbfus; 15 August 1939. Unfortunatley, there are no photos of her on the web besides her grave, so her more famous husband, Admiral Edward Clifford Kalbfus, will have to do. He was a four-star admiral in the United States Navy who was commander of the Battle Force of the United States Fleet from 1938 to 1939 and President of the Naval War College from 1934 to 1936 and 1939 to 1942. 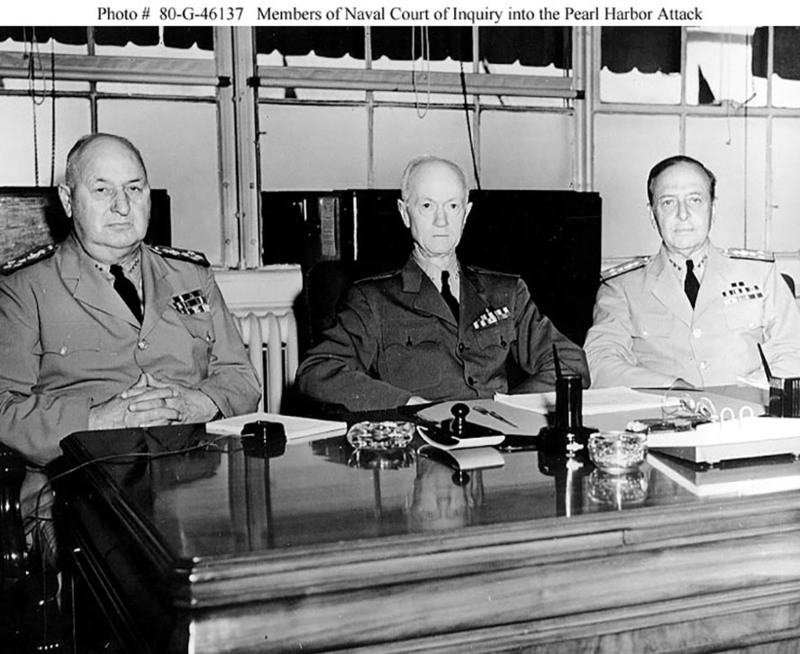 He appears here as member (left) of the Navy Court of Inquiry into the Pearl Harbor Attack, 1944. Photo & text courtesy of wikipedia.com. 780k Seawolf (SS-197) sliding down the gangways, 15 August 1939 at Portsmouth Naval Shipyard, Portsmouth, N.H. USN photo courtesy of ussubvetsofworldwarii.org. 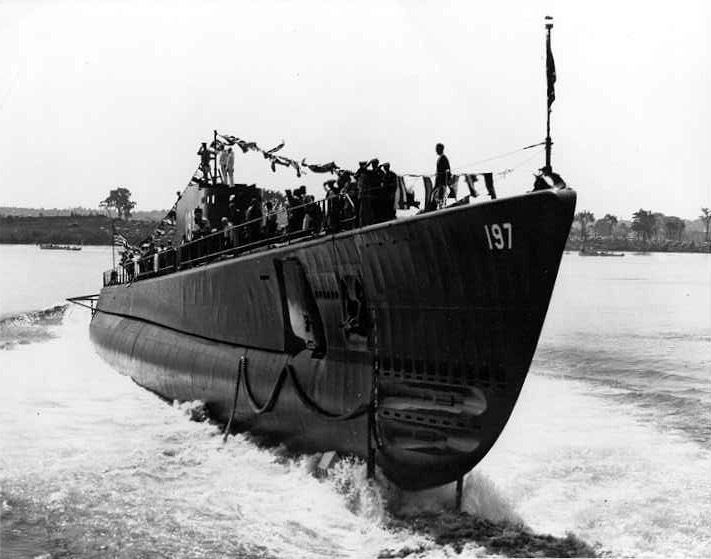 48k Seawolf (SS-197) shortly after launching, 15 August 1939. Photo courtesy of seawolf-ssn575.com. 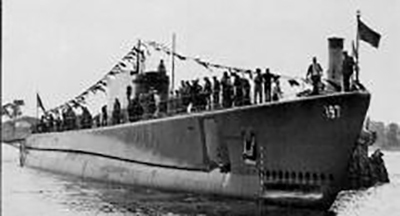 405k Seawolf (SS-197) shortly after launching, 15 August 1939. Wide World / Associated Press photo courtesy of Tommy Trampp. 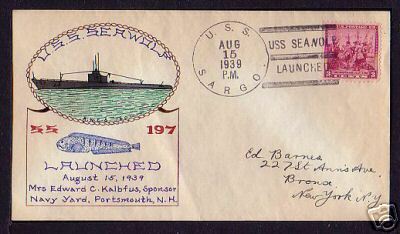 24k Commemorative post mark on the occasion of the Seawolf's (SS-197) launching, 15 August 1939. Courtesy of Jack Treutle (of blessed memory). 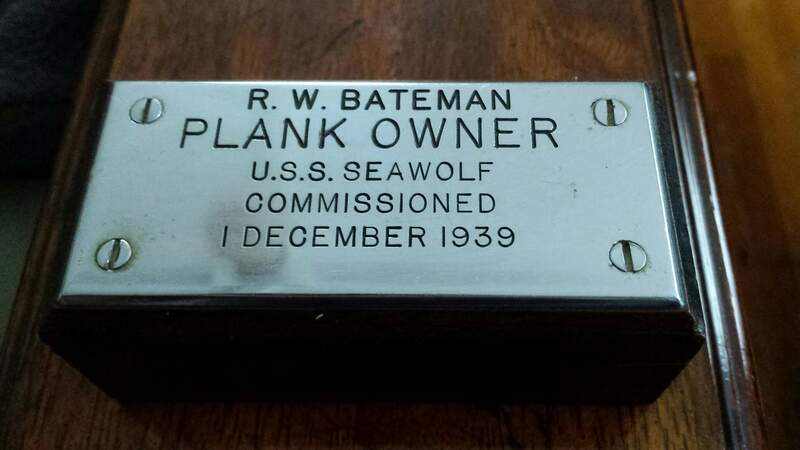 1.03k Seawolf (SS-197) commissioning plank 1 December 1939, from Roy W. Bateman. Photo courtesy of George R. Bateman. 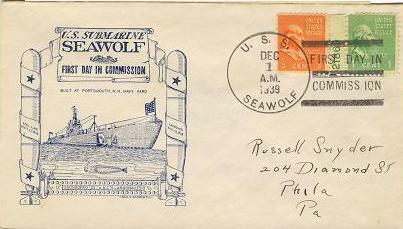 21k Commemorative post mark on the occasion of the Seawolf's (SS-197) first day in commission, 1 December 1939. Courtesy of Jack Treutle (of blessed memory). 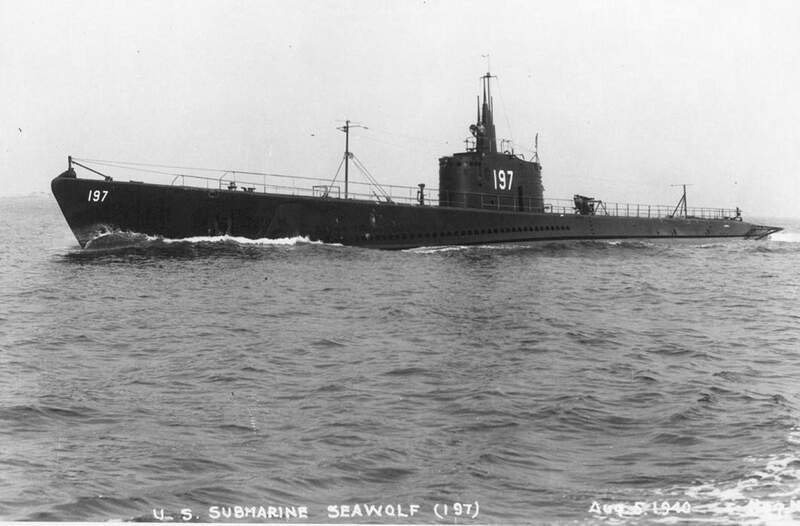 88k Seawolf (SS-197), photographed soon after completion, circa 1939-1940. 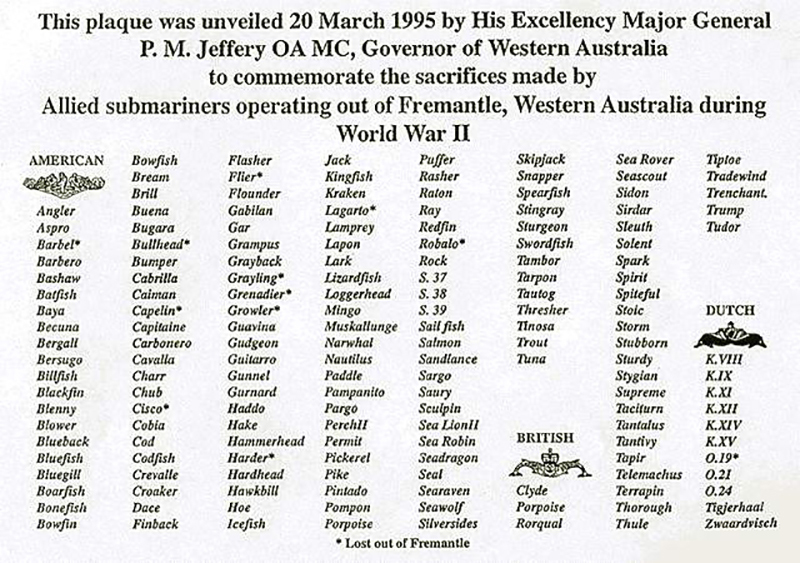 One of the war's great fighting subs, she made her first patrols under one of the wars great under-sea skippers-"Fearless Freddie" Warder. Few subs had more adventures than the "Wolf", bagged more game. Under hard hitting Comdr. R. L. Gross, she sank 12 Jap vessels." Photo & text courtesy of Theodore Roscoe, from his book "U.S. Submarine Operations of WW II", published by USNI. 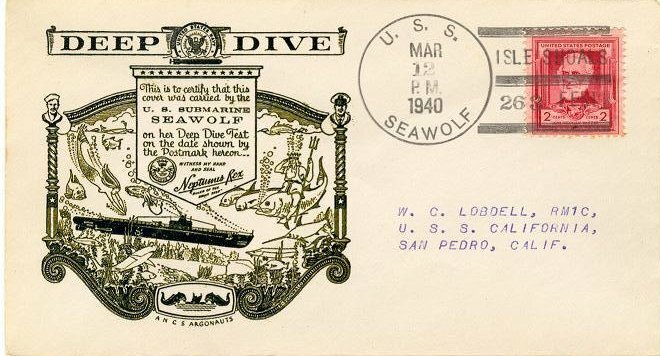 74k Commemorative post mark on the occasion of the Seawolf's (SS-197) deep dive on 12 March 1940. Courtesy of Jack Treutle (of blessed memory). 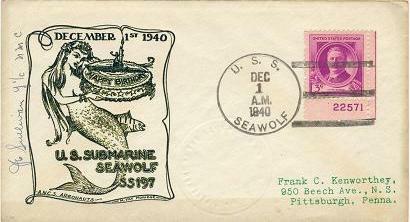 19k Commemorative post mark on the occasion of the Seawolf's (SS-197) shakedown cruise to the Panama Canal Zone, 18 May 1940. Courtesy of Jack Treutle (of blessed memory). 882k After fitting out, Seawolf (SS-197) departed Portsmouth on 12 April 1940 for her shakedown cruise which lasted until 2 June and took her as far south as the Panama Canal Zone. Seawolf was next assigned to the Pacific Fleet with her home port, San Diego. 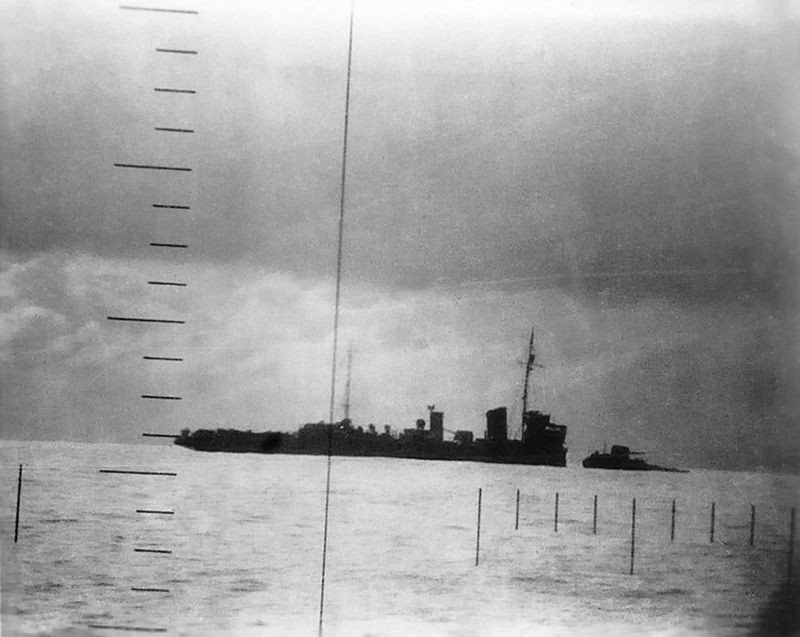 She is seen here on 5 August 1940. USN photo courtesy of Scott Koen & ussnewyork.com. 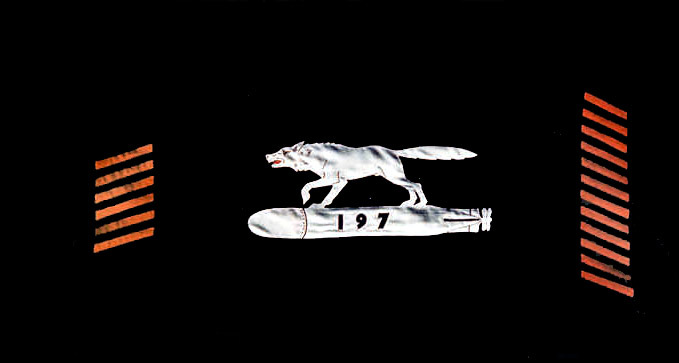 22k Commemorative post mark on the occasion of the Seawolf's (SS-197) first birthday, 1 December 1940. Courtesy of Jack Treutle (of blessed memory). 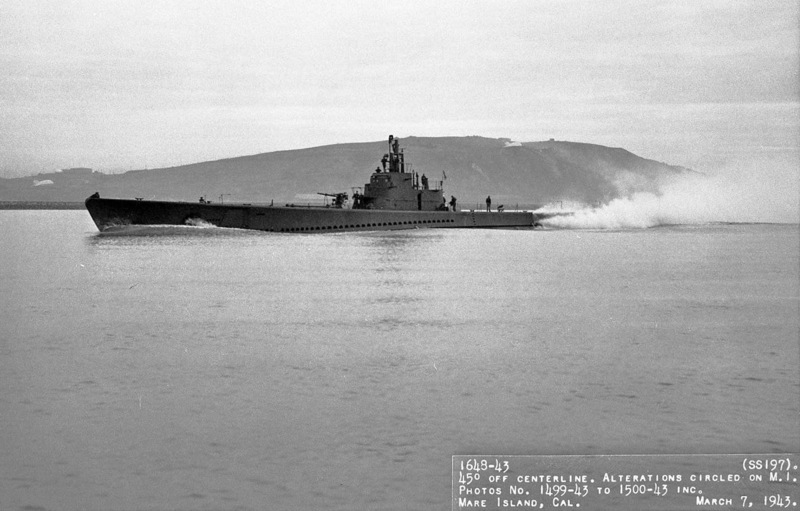 246k Seawolf (SS-197), underway, circa 1941. USN photo courtesy of Scott Koen & ussnewyork.com. 48k Seen by Seawolf (SS-197) at Davao Gulf-Sagami Maru in Talomo Bay. 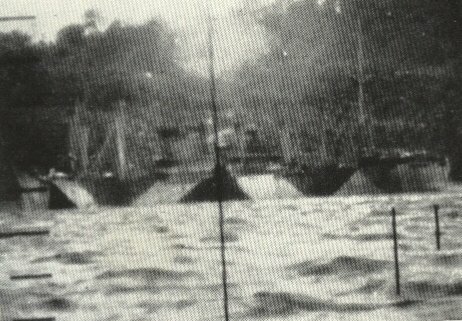 Periscope snapshot shows jungly shoreline; camouflaged ship loading hemp. Then she got a load of - fish from "Fearless Freddie" Warder." Photo & text courtesy of Theodore Roscoe, from his book "U.S. Submarine Operations of WW II", published by USNI. 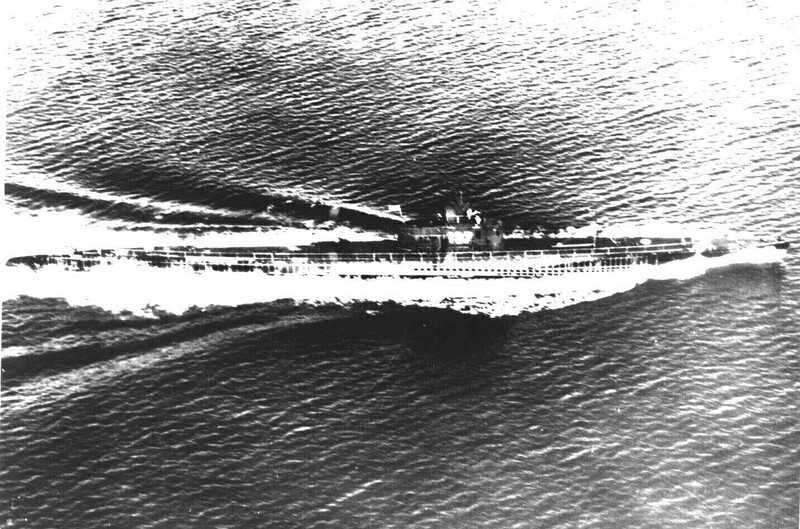 39k Down goes Sagami Maru as out goes Seawolf (SS-197), chased by Zeros. Photo bears out text "maru loading hemp can come to end of rope." Photo & text courtesy of Theodore Roscoe, from his book "U.S. Submarine Operations of WW II", published by USNI. 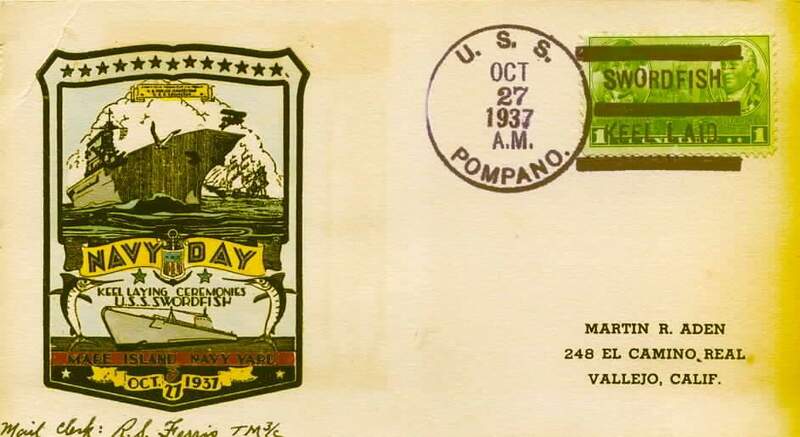 17k Commemorative post mark on the occasion of the torpedoing of six Japanese vessels by the Seawolf's (SS-197) "Fearless Freddie" Warder" between February - April 1942. Courtesy of Jack Treutle (of blessed memory). 337k "Fearless Freddie" Warder". 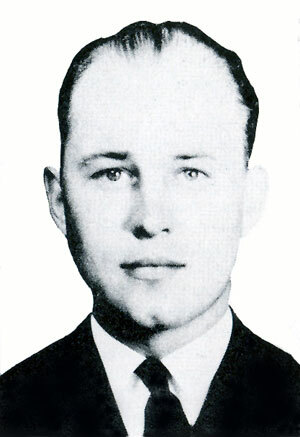 As a lieutenant commander, he was skipper of the Seawolf (SS-197) from 1939 to 1943. 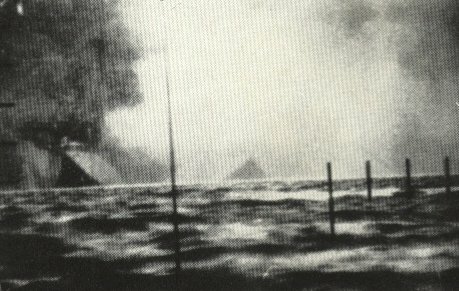 The submarine resupplied the besieged island fortress of Corregidor in the Philippines in spring 1942 and sank a Japanese destroyer, cruiser, transport ship and several other vessels on seven missions in the following months. 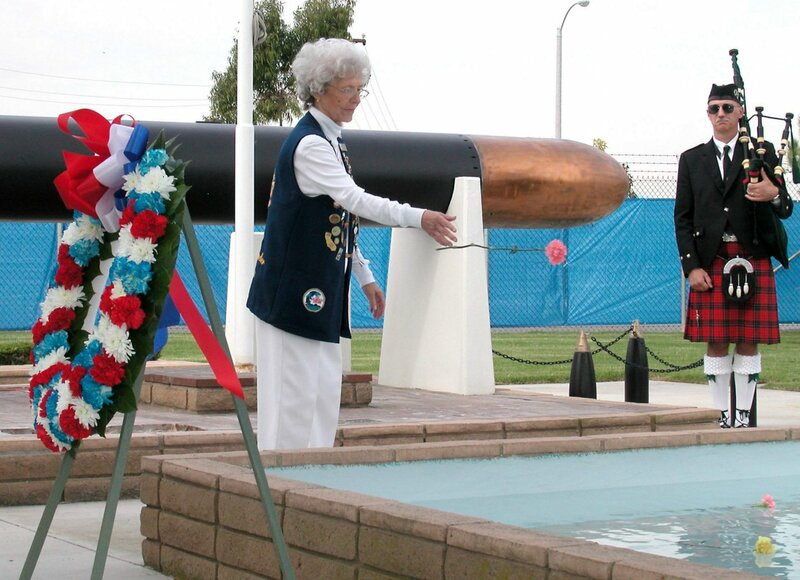 The 38-year-old officer was awarded the Navy Cross, one of the service's highest honors, for his work. 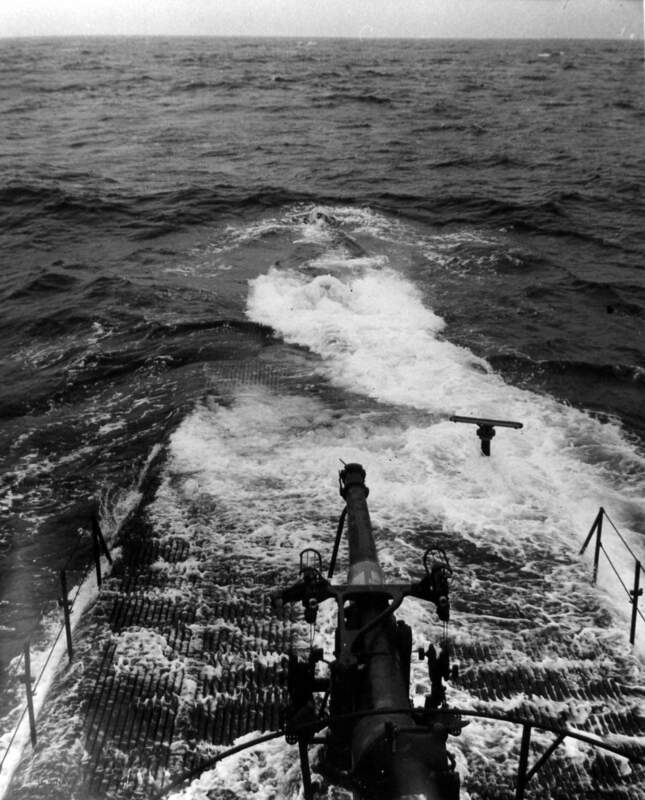 The citation noted that, after firing its torpedoes, the Seawolf was often the target of prolonged depth-charge attacks by Japanese destroyers. But Lieutenant Commander Warder kept a veneer of calm for his men and brought the Seawolf home unscathed each time. Soon, he learned that his crew and sailors from other ships were calling him Fearless Freddie, though never within his earshot. He detested the nickname because he was afraid just like everyone else under enemy fire, and he believed that the real heroes were those who had died. Promoted to commander, he was in charge of several submarines operating in the Mariana Islands. In addition to the Navy Cross, his wartime decorations included a Bronze Star, Legion of Merit and several other medals. 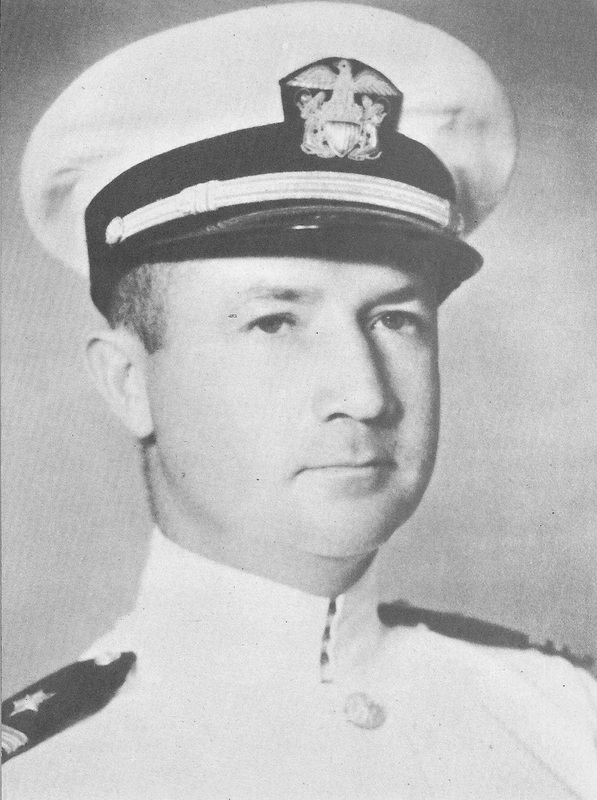 Rear Adm. Frederick B. Warder served his country until he retired in 1962. USN photo from the book: These Men Shall Never Die by Lowell Thomas (Philadelphia: John C. Winston Co., 1943), p. 80.) Text and photo submitted by Bill Gonyo. 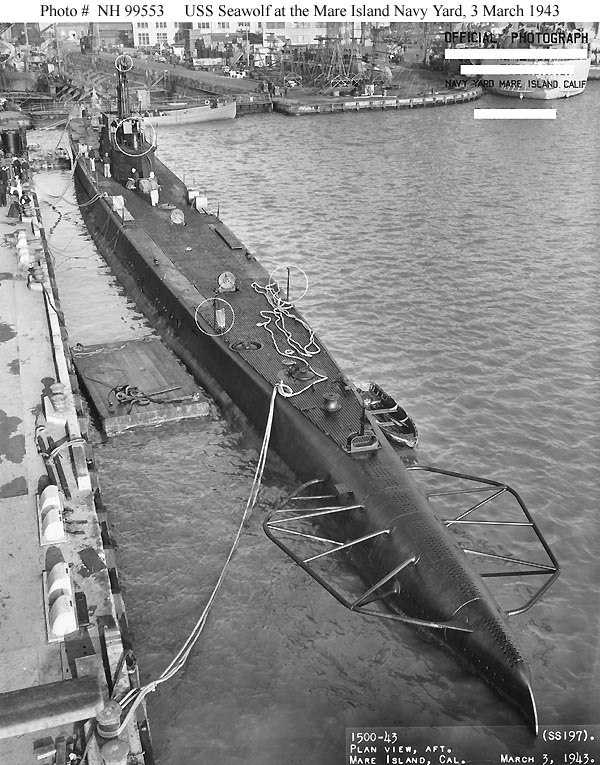 138k Seawolf (SS-197) at the Mare Island Navy Yard, California, 3 March 1943, at the end of an overhaul. 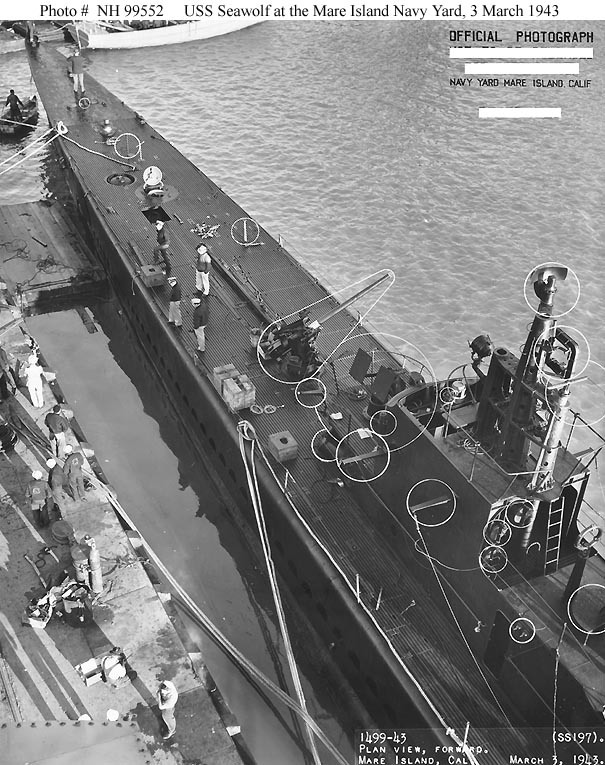 White outlines mark recent alterations, among them relocation of her 3"/50 deck gun and installation of radar antennas atop her periscope shears . Official USN photo # NH 99552, from the collections of the Naval Historical Center. 131k Seawolf (SS-197) at the Mare Island Navy Yard, California, 3 March 1943, at the end of an overhaul. Note Seawolf's propeller guards, and newly-constructed LSTs in the background. Official USN photo # NH 99553, from the collections of the Naval Historical Center. 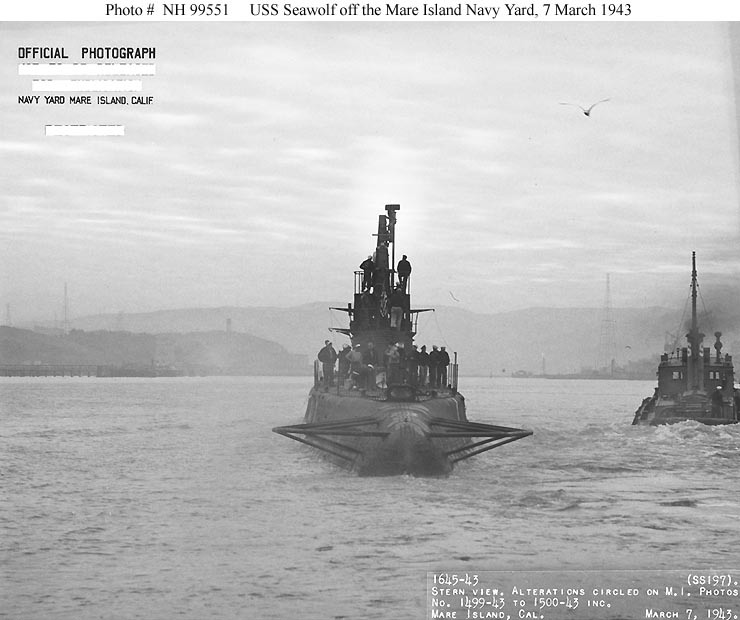 388k Port side view of the Seawolf (SS-197) underway off the Mare Island Navy Yard, California, 7 March 1943.The two large white objects (one high on the hill aft of the sail and other forward off Seawolf's bow are grounded barrage balloons. USN photo from the collections of the Vallejo Naval & Historic Museum & submitted by Darryl L. Baker. 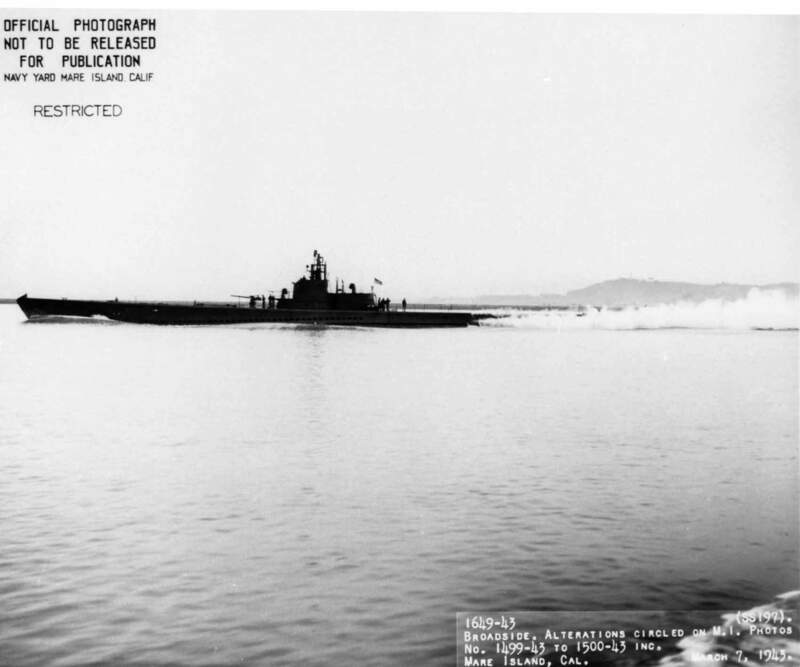 126k Seawolf (SS-197) off the Mare Island Navy Yard, California, 7 March 1943. USN photo # MI-1646-43 courtesy of Scott Koen & ussnewyork.com. 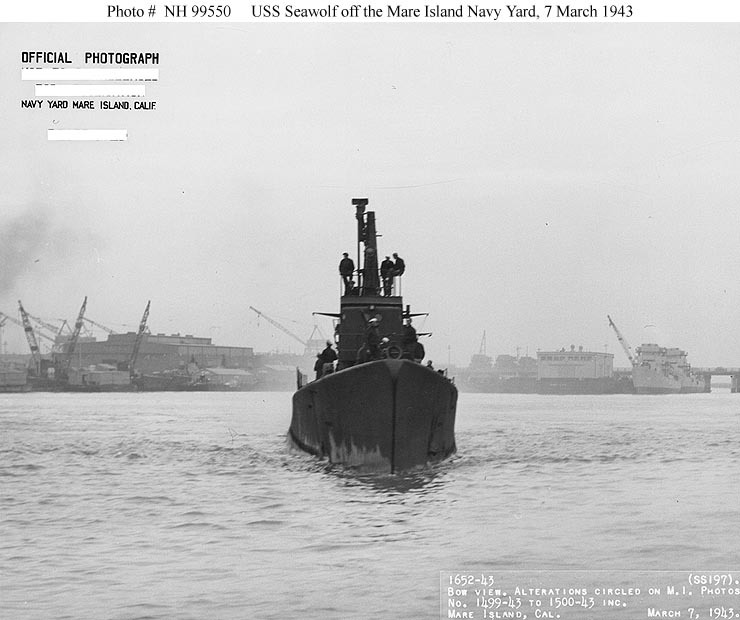 65k Bows on view of the Seawolf (SS-197) underway off the Mare Island Navy Yard, California, 7 March 1943. Official USN photo # NH 99550, from the collections of the Naval Historical Center. 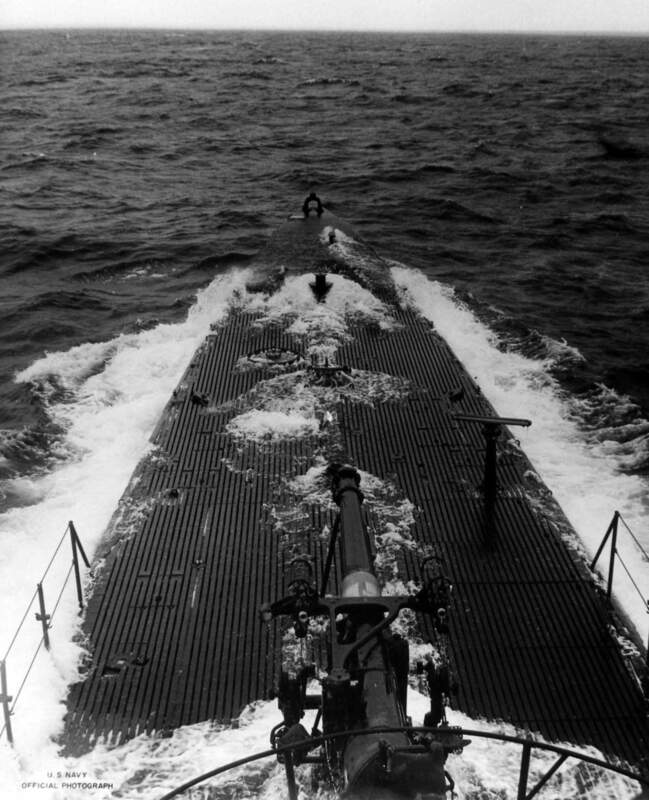 65k Stern view of the Seawolf (SS-197) underway off the Mare Island Navy Yard, California, 7 March 1943. Official USN photo # NH 99551, from the collections of the Naval Historical Center. 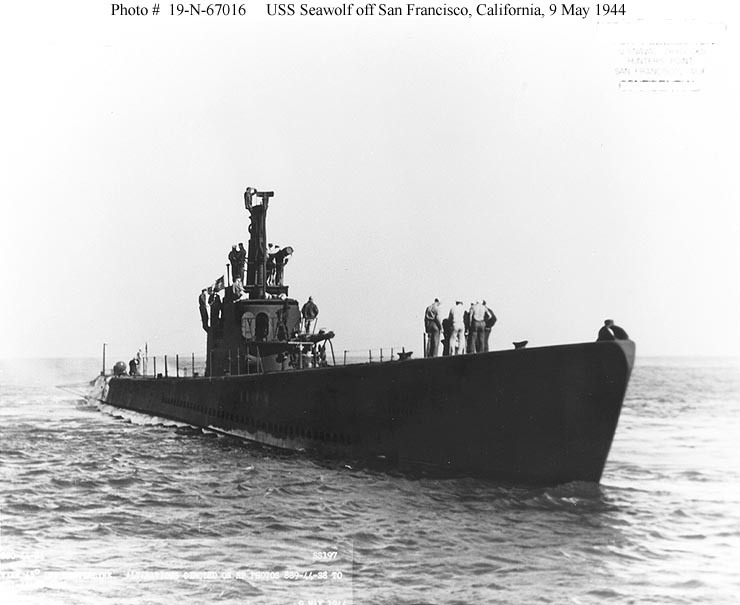 83k The Seawolf (SS-197) is seen off Mare Island on 7 March 1943. USN photo # 1649-43, courtesy of Darryl L. Baker. 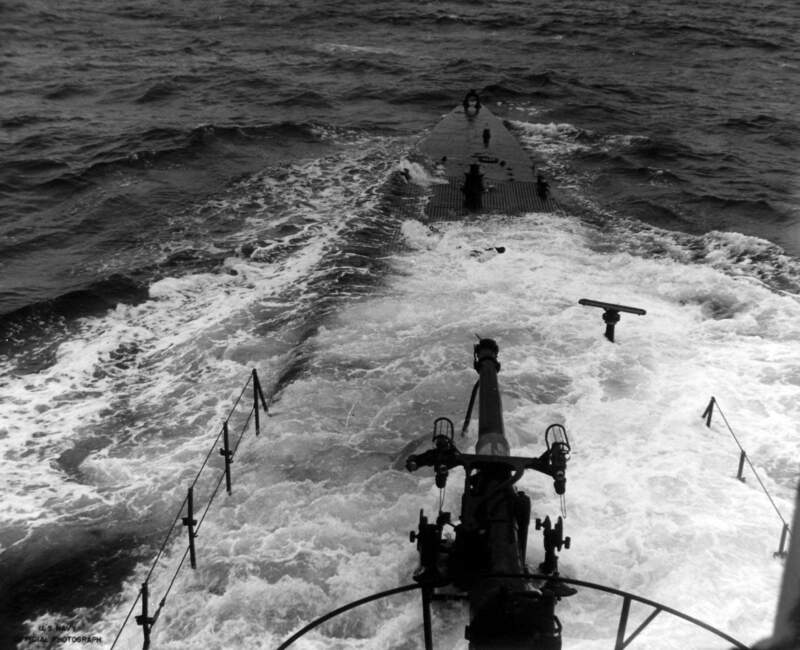 365k The patrol boat (former Momi class destroyer) HIJMS No.39 (ex - Tade) is shown sinking thorough Seawolf's (SS-197) periscope. She was torpedoed and sunk by the submarine Seawolf on 23 April 1943, 150 m NE off Yonaguni, Okinawa, (23 degrees 45' N, 122 degrees 45' E). USN Photo # 80-G-67288 courtesy of Robert Hurst. 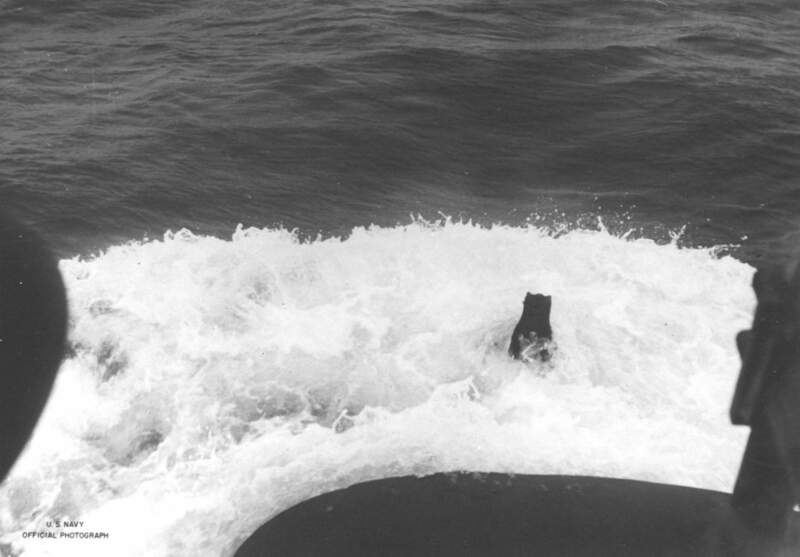 456k The following 6 photos are a series of Seawolf (SS-197) submerging (bow view) and they are all dated 8 May 1944. I believe she had just completed overhaul at Hunters Point Navy Yard in San Francisco and photos were taken during a test dive. The first photo shows her running on the surface. USN photo # 2810-44, courtesy of Darryl L. Baker. 250k The second photo shows her bow and deck gun just starting to become awash. USN photo # 2811-44, courtesy of Darryl L. Baker. 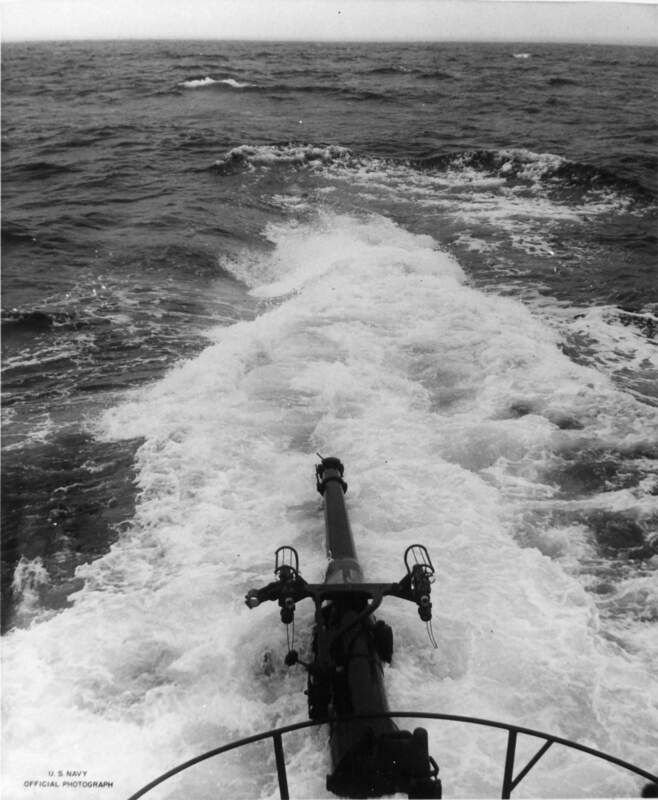 253k The third photo shows her bow submerged & deck gun receding further awash. USN photo # 2812-44, courtesy of Darryl L. Baker. 208k The fourth photo shows her deck gun starting to be covered by the foam of her submerging. USN photo # 2813-44, courtesy of Darryl L. Baker. 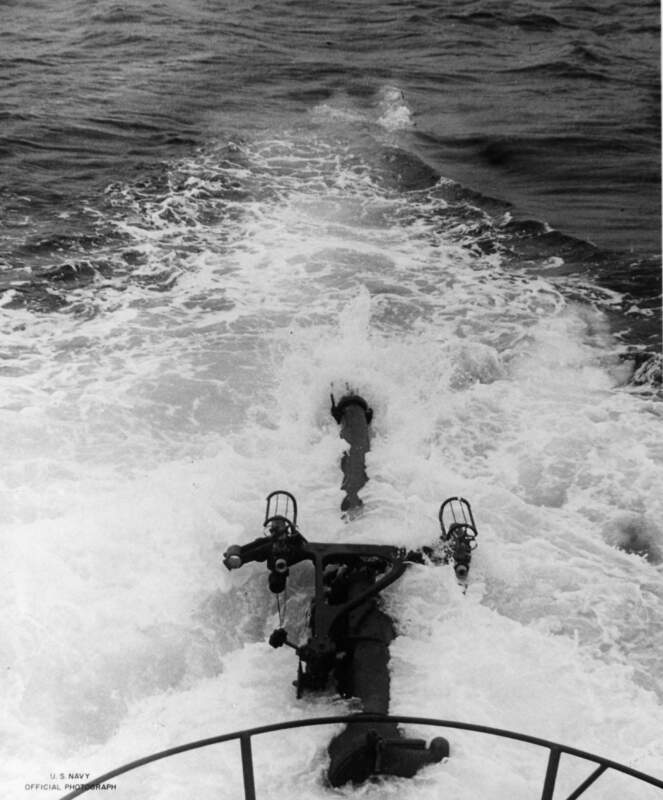 187k The fifth photo shows her bow & deck gun almost completely covered by her submerging. USN photo # 2814-44, courtesy of Darryl L. Baker. 431k The sixth & last photo shows her conning tower starting to become awash. USN photo # 2815-44, courtesy of Darryl L. Baker. 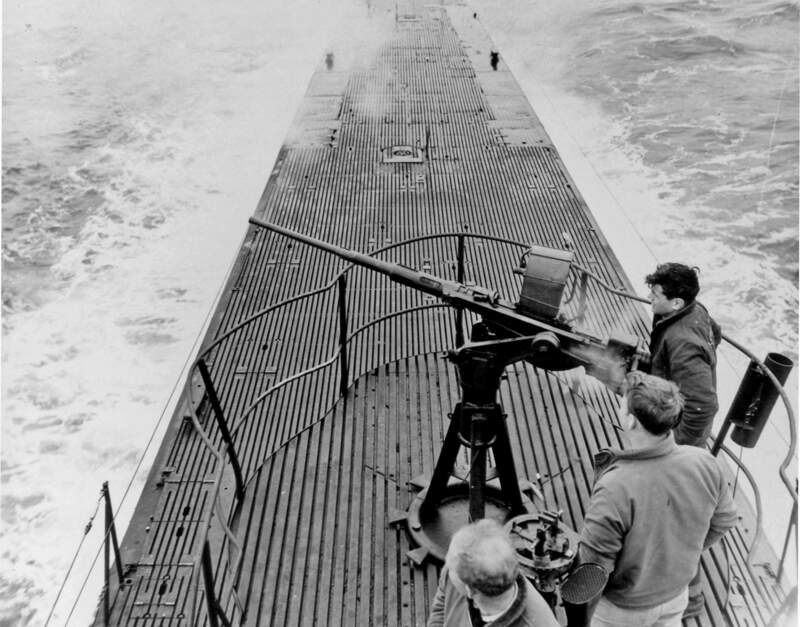 261k The Seawolf's (SS-197) crew firing her aft 20MM AA gun, 8 May 1944 after completing an overhaul at Hunters Point Navy Yard in San Francisco, CA. USN photo # 2820-44, courtesy of Darryl L. Baker. 34k Seawolf (SS-197) patrol scorecard. Courtesy of ussubvetsofworldwarii.org. 26k Albert Marion Bontier, Commander (Commanding Officer) of the Seawolf (SS-197), at the time of her loss. USN photo courtesy of oneternalpatrol. 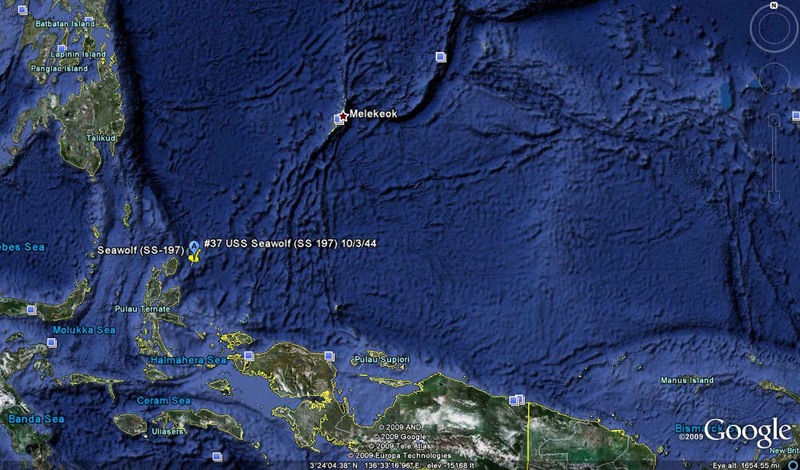 69k Google Earth satellite photo of the general area in which Seawolf (SS-197) is assumed to have been lost. View courtesy of Google Earth. 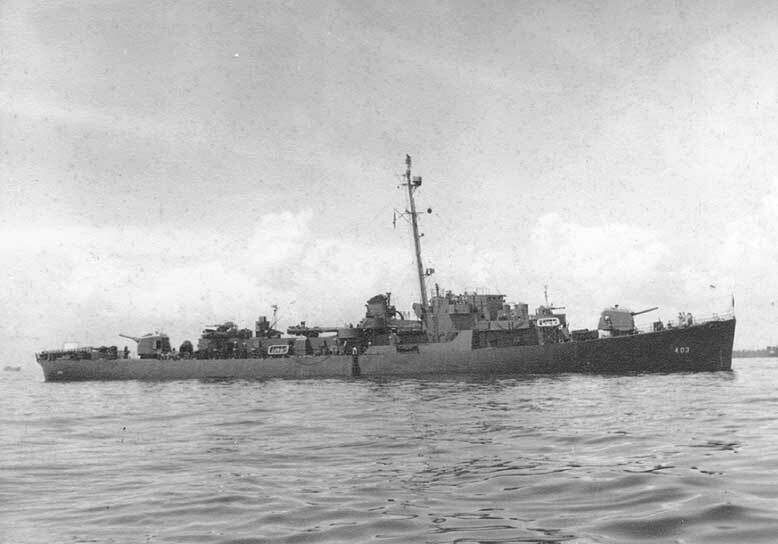 34k The Richard M. Rowell (DE-403) anchored in San Pedro Bay off Samar Island, PI, Sep. 1945, less than one year after sinking the Seawolf (SS-197) by accident. Photo courtesy of James V. Nichols. 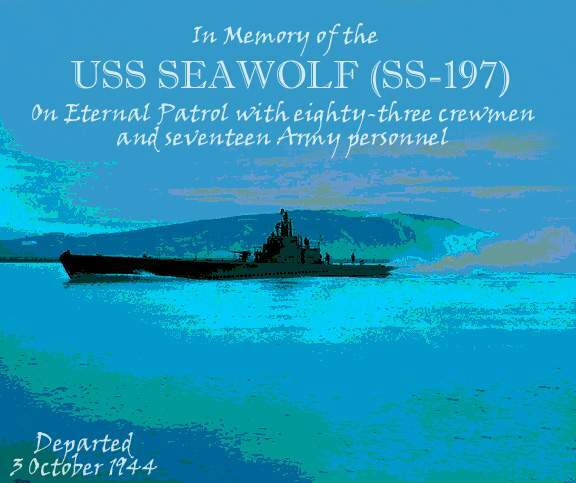 32k Commemorative photo in honor of the memory of the crew of the Seawolf (SS-197). Photo courtesy of Tom Kermen. Dante's Prayer courtesy of Loreena McKennitt via quinlanroad.com. 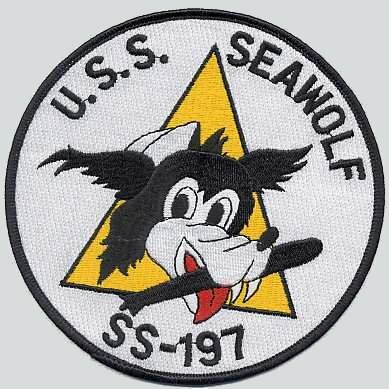 1.05k 7 page PDF history of the Seawolf (SS-197) and her WW II patrols. USN photos courtesy of Scott Koen & ussnewyork.com. 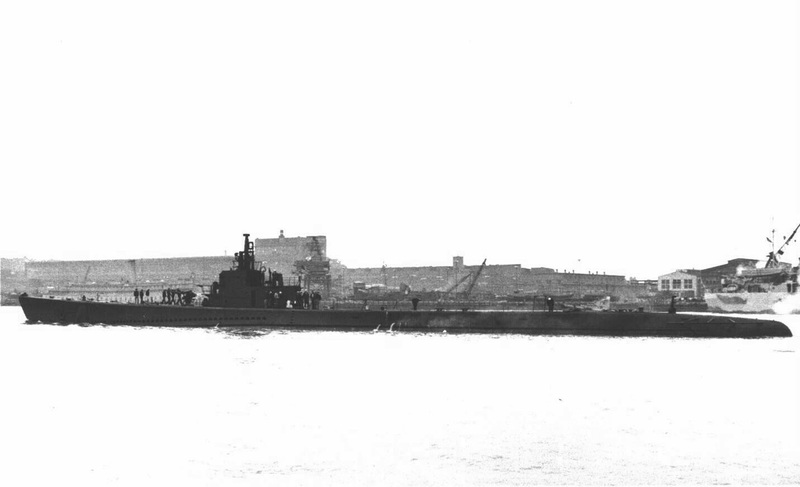 54k Seawolf (SS-197) off the Hunters Point Naval Drydocks, San Francisco, California, 9 May 1944, following overhaul. In less than 6 months the boat and all her crew would be K.I.A. "When the waves of death compassed me / the floods of ungodly men made me afraid; / the bonds of She'ol encircled me; / the snares of death took me by surprise; / in my distress I called upon the Lord, / and cried to my G-D: / and he heard my voice out of his temple, / and my cry entered into his ears. / Then the earth shook and trembled; /the foundations of heaven moved / and shook because of his anger /...the heavy mass of waters, and thick clouds of the skies /... And the channels of the sea appeared, / the foundations of the world were laid bare, / at the rebuking of the Lord, at the blast at the breath of his nostrils. / He sent from above, he took me; / he drew me out of many waters; / he delivered me from my strong enemy, and from those who hated me; for they were too strong for me. / They surprised me in the day of my calamity: / but the Lord was my stay / He brought me forth also into a large place: / he delivered me because he delighted in me./" Official USN photo # NH 67016, from the collections of the Naval Historical Center.